Precision engineering operations require both accuracy and precision. Thermal effects in a precision system represents the largest single source of systematic error and non-repeatability for nearly all ultra-precision manufacturing processes. As a result, minimizing and controlling thermal influences also offers the largest single source of improvement in a precision system and most often at a fraction of the cost of the overall system. How Much Temperature Control Do I Need? Most precision systems show dramatic performance improvement with temperature control 100 times better than ambient. However, the more error that you eliminate, the more accurate your manufacturing processes will be. So, in general, you want to eliminate as much error as possible in as many places as possible, and providing as much temperature control as possible is generally the easiest and most economical way to achieve improved accuracies. Errors in a manufacturing process are cumulative. Therefore, error reduction in one area of your process will allow you to accommodate greater errors in other areas. For example, if you create greater accuracies by using precision temperature control, you may have more latitutde in part and machine setup. Error budgets are useful tools to categorize and predict the errors in precision manufacturing operations. Error budgeting is a methodology that allocate errors to components and processes of an instrument, and predicts the total error of the instrument's action. When creating an error budget, precision determinism states that all error values—both systematic (straightness, squareness, positioning error, etc.) and non-systematic (thermal errors) are cumulative and additive. Therefore, eliminating as much error in any area of the process will contribute to the overall accuracy of the endeavor. What Accuracy Improvements Can I Expect from Precision Temperature Control? A Præcis Environment system can improve the accuracy of a manufacturing or metrology process by a factor of two up to ten. For example, if you have a well-designed machine operating in a poor environment (e.g., +/- 1.0 °C), you can expect a factor of ten accuracy improvement (+/- 0.01 °C). The example below shows an interferometer measurement of a 200-mm long aluminum gauge block as it changed length in typical room temperature variation. A one-degree temperature change caused a 0.0046 mm change in length. Everything Changes Size When the Temperature Changes. One of the most noticeable examples of thermal expansion is the spreading of joints in bridges. These joints allow for seasonal variations in the length of the bridge span as temperature vary throughout the year. In precision engineering, optics, metrology, and other ultra-precise engineering applications, small differences in size are absolutely critical. When a material is heated the distance between individual atoms will change. For most materials the atoms get further apart and the total length change depends on how many atoms are in the length. This makes the temperature change proportional to length. For example, if a one-meter piece of metal changes length by some small amount, a two meter piece would be expected to change by twice the amount. 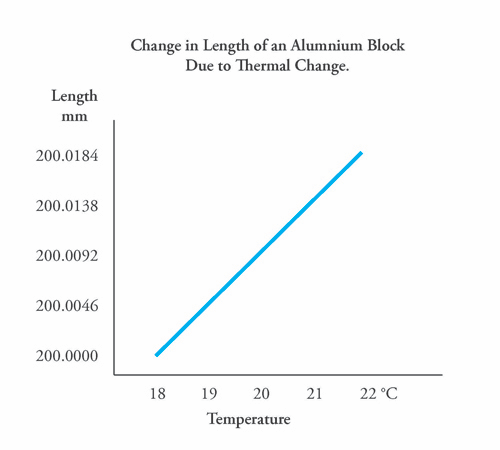 Changes in length is proportional to the temperature change. The constant of proportionality is called the coefficient of thermal expansion (CTE), denoted by the Greek letter alpha (a). Precision instrumentation is built from components of a variety of materials—which, with different CTE’s, expand and contract by different amounts with temperature changes. To further complicate the problem, different materials have different rates of thermal conductivity, making the individual instrument parts and the work piece fluctuate in size at different rates. Because of the complexity of the system and time to execute the activity, the combined thermal changes in a precision manufacturing process are impossible to predict. To prevent the effects of thermal expansion from harming ultra-precision measurements, Praecis Inc. has developed an ultra-precision air temperature control system. By stabilizing the air to +/- 0.003 °C from a set temperature, Praecis ATCU (Ultra Precision Air Temperature Control Unit) can virtually eliminate any thermal instabilities and makes even the slightest precision temperature control and thermal management easier. Learn more about stabilizing the temperature of your instruments and measured parts with precision temperature control. Whoops! How Much Can We Mess Up? As we all know from our cracked cellphone screens, technology isn’t perfect. It takes a lot of work for any company to get a product to you in one piece. This is especially true for technology companies whereas the parts and pieces to one product can be in the hundreds or thousands. But unlike this sphere, nothing is perfect. In fact, every company makes mistakes. It is often known as ‘dead-on-arrival’ or DOA. Quite frankly, it cannot be completely prevented. Companies must plan and decide on how much error is accepted and what can it handle. Many larger companies use six sigma as a tool for controlling production errors. In fact the target is less than 0.00034%. This sounds extreme at first but it is important to keep in mind errors can destroy a company’s operation. It also keeps the product from getting to the hands of the customer. When it comes to manufacturing, engineers utilize an error budget. An error budget is a tool to assist in design. In most operations it is used to predict part accuracy. In six sigma the end result depends on the companies operation and the complexity of the product. If there are too many errors, the company may need to shift to a new manufacturing process. While in error budgeting engineers must decide on which errors they can quantify and correct. In the end, either way, nothing is perfect. But we can get very close. Technology; it’s omnipresent. We use complex tools daily, but inherently forget how much time, energy, and design goes into each new high-technology product, which changes the way we live. There are many people, and stories, behind every part of your phone, laptop, or car. Engineers, visionaries, programmers, artists, technicians, metal workers, and more spend countless hours designing, optimizing, and building each part, subsystem, and product. We never think about certain parts, such as a cellphone camera lens, as a challenge to create. In reality, however, it took a person to design the lens size, another person to replicate this design in CAD software, an ultra-precision engineer to mill the mold for the lens, and ultra-precision temperature control system to get a precise cut to the angstrom level for all eight million reincarnations of the lens. This lens is but one small part of the cell phone.